2. The equipment used should ensure the safety of the dog owner, the dog, animals and people within a dog's reach - NOT - Just the dog's safety. 3. Dog training equipment should be chosen logically on a case by case basis, and not for ideological reasons. 4. The equipment should allow the owner to easily maintain control of the dog’s head. 5. The equipment should be capable of making it relatively easy to acquire a dog’s attention -NOT - for physically correcting a dog. 6. The equipment should make it difficult to impossible for a dog to successfully tsunami their owner with the dog’s speed, strength, and agility should the dog become over-zealously joyous or aggressive towards their owner. 7. The equipment should be relatively uncomplicated from a learning curve perspective. 9. The equipment should be dog friendly. In other words a loose leash walking dog should have a bounce in its step and not be walking the walk of the damned. 10. Goal is for the equipment to eventually become a rarely needed emergency brake - NOT - a permanent crutch. Select the correct approach to training as well. Good dog training is a lot like good driver training. Yes, in the early stages we kept our hands clenched tightly on the wheel and one foot poised over the brake and either us or our driving instructor kept a hand available to grab the emergency brake. Yes, we used the brakes far more frequently than once we learned how to do it all and got enough road experience under our belts. However, if we had a good enough driving instructor we eventually learned to relax and reasonably efficiently get from Point A to Point B without mishap. The dog training equipment you select is both the steering wheel and the main and the emergency brakes in the above analogy. You want power steering that in the early stages allows you from a physical perspective to easily turn your dog but is eventually predominantly replaced, except in times of emergency, with the ability to ‘turn’ your dog with your tone and body language. You want to have brakes that are and will always be capable of stopping the vehicle you’re driving and you want to learn how to use those brakes in the way they were intended to be used so, in the long run, you end up needing to use the brakes far less. Your selection of a driving instructor will go a long way to ensuring this happens but even the best driving instructor can’t keep you on the road if your brakes aren’t good and the steering requires the arms of Arnold Schwarzenegger. If your ‘All Positive/Purely Positive/Force-Free…’, treat, treat, treat ‘driving’ instructor tells you that all you need is a harness and some treats and you’re driving what is physically or mentally a Mack transport truck you’re in for a fair amount of frustration and you’ll have a life ahead where you only going driving when you have to and when you do you’ll find it far harder to keep between the lines than it should be. If your ‘Might Is Right’ ‘driving’ instructor approach is all about slamming on the brakes you might be able to get from Point A to Point B but it’s going to be a little hard on the vehicle. You should be choosing training equipment that is appropriate for the vehicle you’re driving and training instruction (‘Fully Balanced Companion Dog Training’) that ultimately leads to a dog that can exert self-control even in life’s heavy traffic moments and if tempted can be steered and braked with your tone and body language alone so that the training equipment only comes into play in emergency situations. You should be avoiding training equipment and training approaches that won’t serve this purpose particularly if they don’t have the potential to be retired to the emergency brake only use category. If you want to keep the leash from being ripped out of your hand, being dragged, your dog getting loose and getting hit by a car or attacking another dog or a person, ensure your own safety, your dog’s safety and the safety of all others select equipment that has emergency braking stopping power. A good rule of thumb is to do the following math. If a dog weighs 60 pounds (27 kg) because the dog has four-wheel drive and four attached to the floor and a low center of balance – in human terms indoors that dog is comparable to a 180-pound person (82 kg). Outdoors and distracted to agitated the same dog is closer to 240 pounds (109 kg). There are far too many preventable injuries to people, dogs, and other animals because the equipment recommendations made by a dog trainer was made on the basis of their arbitrary and more often than not factually inaccurate and myopic definition of ‘humane’. Dog trainers and an increasing number of veterinarians and vet techs that believe in the pseudo-science that is ‘All Positive/Purely Positive/Force-Free…’, treat, treat, treat and typically lose their minds if anything other than what they deem to be the ‘most humane’ apparatus is attached to a dog. As of the writing of this article, the current flavor of the month is some form or harness which is fine if you want to abandon the realities of physics, biomechanics and pre-adult canine physiology. If it were just a matter of recommending whatever piece of equipment that is currently being marketed to the non-critically thinking and seemingly gullible, it would be one thing. A serious thing but still just one thing. However, they go on to dictate, sometimes literally legislatively what they deem to be cruel and/or necessary. Any dog trainer, veterinarian or vet tech that labels any piece of dog training equipment as ‘cruel’ had best justify the use of a scalpel as there’s no comparable and potentially dangerous tool in a dog trainer’s arsenal. One that opposed to any piece of dog training equipment requires medication for pain post use every single time. And yet, whether it’s a Machiavellian justification or not I would not argue that there are times when a scalpel is necessary and if accompanied by knowledgable expertise most would agree, justifiable. I don’t know how the number of botched surgeries performed by highly trained and educated veterinarians compares to the number of times dog training equipment has been used in an equally inept manner but bottom line, it’s not the tool, it’s the fool at the end of the tool that should be the first consideration. The resultant alternate logical fallacy offered as a legitimate argument to ‘this is cruel, or that is cruel’ is that the science of dog training has advanced so much that we can now train our dogs in an ‘All Positive/Purely Positive/Force-Free…’, (treat, treat, treat) manner. NO – WE CANNOT, and no scientific evidence remotely suggests this. We can teach tricks in controlled settings in that manner, but no higher order social species teaches life skills for the real world with that as the only tool in their tool bag. Very likely because if they did, we’d all be dead or in jail. The parents (teachers) of every higher-order social species are always faster, stronger and more agile than their offspring. For fundamental reasons. If they can’t be caught, they can’t be taught. If they think they’re stronger, they won’t listen any longer. Because puppies mature at a much faster rate, on average by the time they’re 10 weeks old, they are quicker and more agile than their human counterparts. Add to the mix those razor sharp teeth and left unaddressed the teacher/student applecart is overturned. 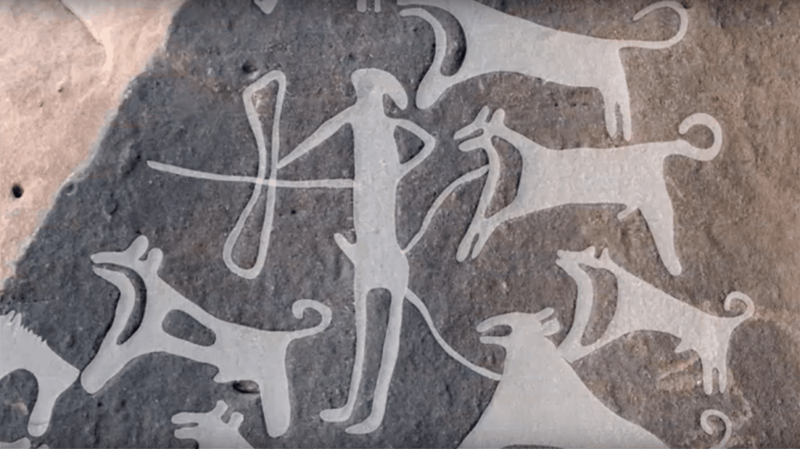 The ‘All Positive/Purely Positive/Force-Free…’, the answer is to ignore evolution and replace it with something better? The reason every higher-order social species parent is faster, stronger and more agile than their offspring, typically until their youngsters are young adults for as long as they are is because it’s a significant factor in the development of a loving, respectful teacher/student relationship, learning the hot vs. cold tone and body language messages and appropriately responding or alternatively experiencing appropriate consequence. If my sons had been faster than me before I’d been able to shape a loving teacher/student relationship they’d still be naked. If you can’t catch them, you can’t clothe them. ’All Positive/Purely Positive/Force-Free…’, treat, treat, treat that chose to ignore and work around evolutionary biology and psychology do so at their peril and sadly at the peril of far too many companion dogs and dog owners victimized by this recent and entirely unscientifically based fad. The ‘All Positive/Purely Positive/Force-Free…’, treat, treat, treat dog trainers dismiss the physical realities, often insisting on harnesses and ineptly attempt to work around evolution primarily by attempting to influence behavior by creating an addiction to treats mistaking it as a healthy parent/child, teacher/student relationship. Can the liver treat influence behavior? Yes, but in a limited manner when compared to using nature’s template. If all you want to do is to teach tricks and sometimes slightly more when the dog’s susceptibility to treat addiction is unnaturally high, however aiming at a dog’s stomach is missing the best part of a dog and is an amateur’s approach to companion dog training. Far fewer in number than their ideologically polar opposite but equally unenlightened brethren the ‘All Positive/Purely Positive/Force-Free…’, treat, treat, treat dog trainers equipment is a means of dominating the dog. They often make unconvincing (at least to my mind) arguments about having to be ‘Pack Leader,’ ’Alpha,’ or ‘Dominant.’ These terms have their place in behavior, but in the context of raising offspring, it’s a skewed misguided use. Mother dogs are loving authority figures that occasionally mete out, “I guess, you should have listened the first three times, maybe you’ll listen the first time.”, level consequences. They are not addicted to alpha rolls or yanking and cranking at every misstep. These trainers typically use a pinch/prong, full-slip (choker) or e-collar on every dog they train. As you will read below in the equipment pros and cons descriptions and read above, it’s not the tool that is potentially the problem it’s the fool and perhaps the foolish use of the tool that is more the problem. These trainers believe that the equipment is a means of correcting the dog as opposed to means to get the dog’s attention sufficiently to correct the dog with tone and body language. The reason being is that it works. Pain is effective. It is however for excellent reasons, not a vehicle that normal parents use to guide their youngsters into adulthood. As you’ll read below in the pros and cons section, the problem is more about the way this group of trainers uses these tools as opposed to an inherent problem with the device themselves, although there are some of those problems as well. The goal of any ‘Fully Balanced Companion Dog Trainer’ (the only legitimately scientific approach to companion dog training) is to teach the companion dog owner to teach their dog to exert self-control – ‘No Matter What,’ when told to ‘Stay,’ ‘Come’ and “Heel.’ The companion dog owner, in the end, becomes the real leash and collar and the physical leash and collar an emergency brake. ‘Fully Balanced Companion Dog Trainers’ understand that collars are not for correcting/punishing a dog. They are for safety and getting a distracted dog’s attention. Fully Balanced Companion Dog Trainers understand that dogs and dog owners vary and that what might be completely appropriate in one case will not be in others. As a result, they assess the dog and then the dog’s owner and make recommendations. Additionally, as training progresses, the collars may change. If you’ve ever tried to get a puppy to stop mouthing or a dog to stop jumping or separate a couple of irate dogs you know how important it is to be able to control the head. Hardnesses require way more effort for the human and often just amp up the dog. Safety aside, it’s very important in training as well. If you can control a dog’s head, you’re one step closer to gaining access to the dog’s mind. If you can’t, you’ll find that you’re one step closer to believing you need treats or pain as a means to motivate your dog. Head control means being able to efficiently turn the dog away from something he or she doesn’t want to turn away from. It means being easily able to get your dog’s attention long enough to hear your tone and perhaps notice your body language to see if it’s ‘Warm’ vs ‘Cold’. Head control also means that you have sufficient leverage to keep the dog from overwhelming you physically. 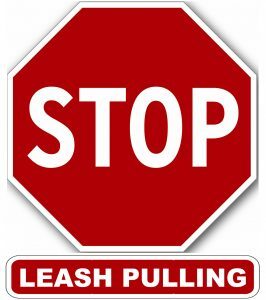 If a dog becomes over excited and begins to mouth and/or jump at the person holding the leash the collar should allow that person to easily discourage this level of physicality without hurting the dog. Dog’s can be a lot like men watching sporting events. Whether they are listening or can just hear you and how much they take in depends on how much of their attention you succeeded in acquiring before you began to communicate. ‘Fully Balanced Companion Dog Trainers’ do not use collars to correct a dog. They are used as a means of getting a dog’s attention so that the dog’s owner can begin to teach a puppy or a dog what various aspects of their owner’s tone and body language mean. This is consistent with parenting in all higher order social species. We use our superior speed, strength, and agility in various ways to keep our youngsters safe and educate them regarding tone and body language so that we don’t always need to be faster, stronger and more agile. Equipment doesn’t correct a dog, the owner corrects the dog, and a correction is not a painful yank and crank on a leash. The leash and collar come into play as a means to get attention – only – if that attention is elsewhere. Used just to acquire a distracted puppy or dog’s attention so that the application of ‘You’re Warm!’, and ‘You’re Cold!’, tone and body language can commence. If the level of distraction or agitation in the dog is so high that getting the dog’s attention risks causing the dog pain there’s something seriously wrong in the reasonable expectations department and training needs to be slowed down and/or broken down into smaller chunks. A dog has four wheel drive, four on the floor and as a result, a sixty-pound dog is closer to being a 180 – 240 pound human than a 60-pound human. Hence the portion of the earlier rhyme, “If a dog thinks it’s stronger, the dog is less likely to listen any longer.” Furthermore, until a dog is trained, it is essential that the equipment attached to that dog allows for sufficient control so that the owner is not dragged down porch steps, into the street or comes home from every walk with one arm slightly longer than the other. Some dog training tools require more finessed handling skills than others in order to do their magic and as importantly not do harm. Others are rarely used to actually train the dog but more to work around the lack of training. Not a huge issue but some collars require more fiddling to put on and take off which if you’re wearing gloves or have digital dexterity problems can be a pain. Also, an issue if the dog is untrained as getting them to sit still for basic snap together collar is hard enough. This is almost always more ‘use of tool’ issue rather than the tool itself issue, but some dogs just hate wearing certain types of equipment and it takes the starch out of them in an unhelpful manner. The most common culprit is the head halter type collars. However, some dogs are old souls and the associated sensitivity with that type of temperament should be taken into consideration when selecting a training collar. All most all dogs that come out of ‘All Positive/Purely Positive/Force-Free…’, treat, treat, treat companion dog obedience classes are reliant for life on treats and whatever equipment is used, as the dog rarely learns to actually exert self-control. If asked how reliable the dog’s response to being told to do the three most important life skills (‘Stay,’ ‘Come’ and ‘Heel’) around distractions typical in the home and around the neighborhood the answers aren’t encouraging. Typically, even with a leash attached to a collar or harness, the answers range from, “No” to “Sometimes” to “It Depends”. If you were to ask someone whether their significant other was faithful, another pretty significant self-control lifestyle impacting expectation in a relationship and the answers ranged from “No” to “Sometimes” to “It Depends”? 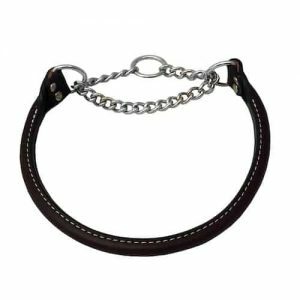 Perhaps after reading this article, you will decide to select for your training a collar that provides a fair amount of leverage. Maybe because your dog is huge. Maybe because your dog’s attitude is huge. Remember that the equipment is a tool and the purpose of this tool is to assist you in teaching your dog to respond to you and not the equipment. So, while the selection of equipment is very important, the selection of the approach to training is even more important. With the principle of least intrusive, minimally aversive philosophy in mind, when training a new puppy or dog, I start off in a calm environment and often just start off with a basic flat buckle collar. After I’ve had an opportunity to observe the companion dog and owner work together, if I think it would help the owner and/or companion dog, we might try a different collar that provides a little more leverage. For a puppy, I just use a regular buckle collar (or a harness if it’s a tiny breed). When I say buckle, I mean buckle as opposed to snap together, I’m referring to the buckle apparatus you find on a belt. You find the right hole, put the prong through the hole. The right hole is the one that makes the collar fit so that the dog could never pull out of it. I choose leather over nylon because it’s easier to punch holes to achieve an ideal fit. You’d likely have to work very hard and on average, the success rate would be fairly low. Not a bad choice for puppies although I do prefer a Martingale as you don’t really need emergency brake status. However for larger dogs that are untrained or not well trained it doesn’t give a ton of leverage from attention-getting potential or emergency brake stopping power. Depends on the size of the dog. Remember this from earlier? “A good rule of thumb is to do the following math. If a dog weighs 60 pounds (27 kg) because the dog has four-wheel drive and four attached to the floor and a low center of balance – in human terms indoors that dog is comparable to a 180-pound person (82 kg). Outdoors and distracted to agitated the same dog is closer to 240 pounds (109 kg).” If you think your dog might give you a run for your money probably not the collar for you and your dog. If you’ve ever worn a belt you’re qualified. Yes, not a problem for most people. The most common collar sold and ironically the most dangerous. For dogs that are untrained and in training avoid these collars which are the snap together designs. Reasons below. As you’ll read below I do not believe this type of collar should be used on any dog for training. Should not be used under any circumstance. These are very dangerous. Perhaps the most hazardous of all collars. The majority of dogs that get hit by a car were wearing one of these collars minutes before the impact. They are not designed to have a leash attached until a dog’s training has been completed. Even then, they wouldn’t be my first choice. The problem is not that the snap will unexpectedly unsnap (although I have seen this happen — particularly in colder climates). The problem is that when the collar is adjusted to fit snuggly enough to ensure that it will in no way slip over the dog’s head, they loosen off gradually and catch many companion dog owners unaware. Gravity alone seems to do it, but the weight of an attached leash will accelerate the process. It only takes a couple of days for the snug collar to develop slack on its own. This can come from nothing more than occasional head shaking, but the pressure exerted via a leash will certainly loosen them. It is never evident to the untrained eye. Once they loosen off, they become susceptible to coming off when a dog pulls back/away from the handler and then gives a little corkscrew head twist. The collar will slip off and the next thing you know the dog is out in traffic. When this type of buckle first came out, there was often a tag attached that said, “Not for an untrained dog.” There still should be. Should not be used under any circumstance. More often than not though I’ve found a safer training choice for a puppy to be a Martingale design collar. They’re flat, and in circumstances where other ‘snap together,’ and buckle collars might slip over the dog’s head, a Martingale will instead snug up. The images below show three designs. 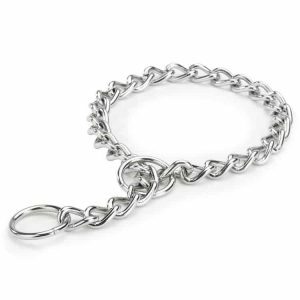 The first uses the same material as the rest of the collar to limit slipping over the head, then a short length of chain. You’d think, six of one, half dozen of another but with the chain, there’s the addition of an auditory aspect when pressure is exerted on either end of the leash (dog or person). Some trainers believe the sound of the chain acts as a warning. I’ve never observed this; however, it might be worth considering when used on a puppy that has never worn a collar at all as the sound of the chain may startle a puppy with a softer more sensitive temperament. The third image is included to show a non-adjustable version. It happens to be chain and leather, but there are non-adjustable versions in other materials. Bottom line is there’s no way to adjust that version, and I’m not a fan. In spite of the fact that I think it’s a great collar for puppies, this is from a safety perspective and because really how much leverage do you really need when it’s a puppy? I see this as more a safety maintenance collar. It doesn’t provide a ton of leverage and I don’t consider it a training collar. 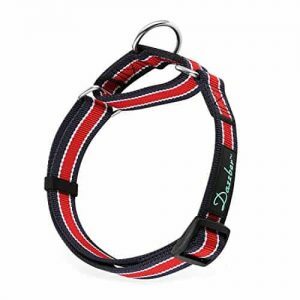 The design of this collar allows it to settle fairly low on a dog and so it doesn’t really lend itself to emergency level handling properties that can be attributed to the collar’s design. However, it does virtually eliminate the possibility of accidentally slip off the head which is something the more commonly used flat snap together collars are infamous for. So that’s worth some points. As mentioned above, the advantage this collar has is more for safety. As a training collar, it’s not really leverage oriented so it doesn’t help in the area due to design. It’s no better or worse than a flat collar when used to turn a dog’s head and therefore the body. No complaints that I’ve ever encountered. Prong/pinch collars have become pretty controversial. They are banned from use in some areas of the world. While I’m not a fan of prong/pinch collars, but not for the agenda driven hysteria attributed to them by many dog trainers. I completely understand why some companion dog owners end up using them, as they definitely provide the opportunity to slam on the brakes. This is very useful when the ratio between the companion dog’s weight and the dog’s owner are unbalanced and/or when the handling skills in the dog owner haven’t completely developed. The most common things I hear from companion dog owners using them is, “I hate using it, but it’s the only way I can control my dog.” They are also distressed because they say that when walking their dogs they continuously get dirty looks from people when they notice the collar. I find it odd and distressing that they are becoming increasingly popular in some training circles particularly amongst newer dog trainers. So far, I don’t like the way they are used by this latest crop of dog trainers that use them almost exclusively. 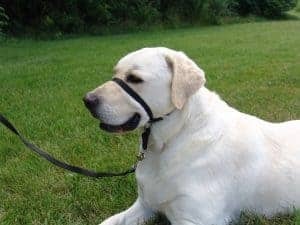 The most prominent advantage prong/pinch collars have is the message sent to a pulling dog is pretty clear without requiring a lot of handling ability on the other end of the leash (owner or trainer). Whether the owner or the dog pulls, the dog gets pinched. After a few of those experiences, in most instances, the dog interested in avoiding pain exerts self-restraint. There are a few problems with this. One is the collar too often becomes the foundation of what keeps the dog under control which perhaps is fine in the early stages of training when the dog’s owner is learning to develop their dog handling skills. However in training where a prong collar is recommended as necessary for all or most dogs, it more often then not leads to what we refer to as a dog becoming ‘collar-wise.’A collar wise dog listens when it’s wearing its training equipment but significantly less so without it. You can definitely train with a prong collar without it becoming collar wise, but in practice, I’ve found this to be very much the exception to the rule when the trainer teaching the companion dog owner and dog is exclusively prong collar based. There’s just not a lot of nuance for how I like to train. These collars inherently physically ‘shout’ at the dog. If you are training, correctly you shouldn’t be ‘shouting’ either literally or via your equipment. In fact, you want to teach your dog to notice and respond to a whisper. Without the ability to apply attention-getting leverage in a nuanced, subtle manner the training far too easily strays into ‘Might Is Right’ territory. This is particularly true when in use by someone lacking a lot of dog experience. The potential for nuance is there, but it takes a while to develop this level of ability, even in people working with many different dogs daily. The norm seems to be used where the dog pulls, or the handler pulls, and the collar pinches. It gives the illusion of training without actually teaching the dog to exert self-control when not wearing the collar. 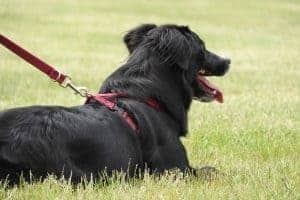 Whether it’s the companion dog’s owner tugging on the leash or the dog pulling, or lunging at something, the sensation from the dog’s perspective can too quickly move from, “I need your attention” to a painful, or just unnecessarily, annoying correction. One of the reasons that I don’t believe a prong/pinch collar should be the first thing out of the tool bag offered to a companion dog owner is the very idea goes contrary to the belief of using the most effective dog training tools that are also the least intrusive and minimally aversive. It has been my considerable experience that when training using a ‘Fully Balanced’ approach very few companion dog owners or companion dogs will need this type of training tool. I want to reiterate, if for no other reason that there’s so much non-sensical information about prong/pinch collars. I’m not saying there aren’t situations where they might make a difference between a person keeping a problematic dog or not, but the only times (and I bet I could count on one hand how many times in 29 years) I’ve recommended them, is when the companion dog owner’s handling ability or physical stability compared to the dog was insufficient for the companion dog owner to be safe. Prong/pinch collars are in part why I designed the Power Steering Dog Training Wade Collar – to provide both dog trainers and companion dog owners with leverage without the downside of the prong/pinch collars which as I say, I think too quickly swing to a physical correction and lack the opportunity to ‘whisper’. The potential is there but the reality is more due to the approach used in training associated with these collars than the collar it’s the collar does the training as opposed to the dog’s owner. The dog avoids pulling because the collar pinches. It’s one of those collars that dog owners often report that the dog knows whether the collar is on or off and behaves accordingly which as I say indicates the dog isn’t actually authentically trained. As mentioned below its not the most nuanced training tool and that’s an impediment for most people if their goal is to retire the collar to emergency brake only status. The majority of companion dog owners that use prong collars reply when asked why “It’s the only way I’ve ever been able to stop him/her”. It’s not the only way, it’s the only way they’ve found but obviously, it scores well in this area. However, there can be drawbacks too, (see above and below). They come apart too often as well. This may be due to manufacturing standards or handler error but whatever the reason it happens too often to give the collar as high a rating in this area as it might otherwise receive. If it’s on correctly yes but when it’s not it doesn’t control the head, more the body when the prongs dig in so no points here. Definitely gets the dog’s attention but it’s more like shouting at a dog to get attention and while shouting may be part of communication it’s something that should only occur if whispering, talking and some thinking hasn’t worked. It’s not impossible to use with subtlety if you have the right environment and if you have some significant experience using this type of collar. All in all too many ifs. Yes, not bad but once again because of the lack of subtlety there’s a chance with some dogs that they become confused or angry and you escalate when a more nuanced level of control might have not done so. You wouldn’t think particularly complicated as it’s basically a Martingale with prongs but based on how many times I see these with too many prongs and sitting at the wrong part of the dog and how rare it is that the need for such a collar is reduced to emergency brake status as opposed to the vehicles main brakes it’s rating in this area is low. Designs vary and as mentioned earlier while it may technically easy to put on and take off there seems to be an opportunity for error as they’ve been known to pop open too frequently for my liking. It’s not as bad as you would think from looking at one or listening to the hysterical rantings of the ‘All Positive/Purely Positive/Force-Free…’, treat, treat, treat crowd but it’s not what I would call dog-friendly. There may be room in the trainer tool bag for one as an option but with the other tools available if in 30 years of training I’ve recommended one more than three or four times I’d be surprised. As mentioned earlier it’s more a shouting collar than talking or whispering and no one likes to be told, “Be quiet or I’ll shout at you until you shut up.” Even so, you just end up with a dog that shuts up – as long as they’re wearing the collar. Not my idea of dog training or dog-friendly. This design is very likely the first collar ever used on a dog albeit not in a chain and probably strips of leather. Very likely because it’s the simplest mechanical means of preventing an untrained dog from slipping away. 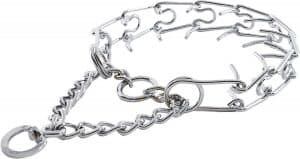 The biggest problem with the traditional chain choker/slip collars overall is even if you’re going to use them correctly they are at their most effective when they are kept just under the dog’s jaw and behind his or her ears. This is pretty difficult to do as they are designed to slip over the dog’s head and because they are big enough to do so, the moment the leash goes slack they (particularly the chain versions) slide down almost to the dog’s chest which is a power base. Without the leverage, you get more of and yank and crank response from some inexperienced handlers and trainers. Some slide down past mid-throat which isn’t ideal either as it’s uncomfortable for the dog and can be potentially dangerous (hence the choker). Either way, it negates most of their advantages. The only way to keep them up high is to keep the leash tight which is (if your goal is loose leash walking) counterproductive. The collar, in essence, defeats its own purpose much of the time. As important, if not more so, leash tension actually encourages leash pulling in many dogs. It is also a significant contributor to problems with aggression in dogs as when the companion dog owner tenses the leash up every time another dog or other distraction is in the vicinity, a lot of dogs take that as a signal to become alert. I’ve heard many trainers say that the sound of the chain rattling when the leash is tugged serves as a warning as well. Well yes, but only if the dog’s experience with the equipment has been significantly negative – Yank & Crank – ‘Might Is Right’. So, I’ve learned that trainers that say this are unintentionally revealing that they are ‘Might Is Right’ trainers. Choker/slip collars slide down less when worn by dogs with longer, thicker coats as it helps to keep them from sliding down and negating its proposed advantage. The problems just mentioned are what motivated me to come up with the design behind a far better version of my own design – The Power Steering Dog Training Wade Collar. Still a slip collar, but stays up nice and high far longer. It’s typically my go-to collar when a flat collar or Martingale won’t do the job and is what I recommend to clients that have been struggling with their dog’s physically and with getting their attention during training. My version has had a very positive impact on thousands of dog’s lives and is sold online. The potential is there but as you’ll read below because they so often end up sliding down so low on the dog’s neck they elicit more of a yank and crank usage as opposed to the power steering version (The Power Steering Dog Training Collar) so potential may be there but rarely realized. Sort of but if the dog is of any size at all usually by the time the handler clues in the collar is down low on the dog’s neck so the handler still ends up having to wrap the leash around their hands a few times and dig their heels in. At least it’s not prone to slipping off, so partial points. If it stayed up behind the dog’s ears and under the jaw like the Power Steering Dog Training Collar but that’s not the way it’s designed so it doesn’t give head control. Difficult, not but less easy than a flat collar. If it weren’t for the ‘Might Is Right’, yank and crank trainers I might say so but even the name “choker” points people in the wrong direction on how a training collar should be used. You don’t see a lot of dogs complaining. They’re indifferent which is a good thing until you want to do some training and they’ve slid down to the dog’s shoulders. Sometimes referred to as shock collars, although the term shock is a bit, but not entirely a misnomer. If you’ve ever had physiotherapy, you have probably felt the stimulation from a transcutaneous electrical nerve stimulation (TENS) machine, and as a result, you’ve felt the stimulation of an e-collar. The sensation is virtually identical. The settings work similarly in that they can be set low enough to be undetectable, to settings that will undoubtedly make you sit up suddenly and uncomfortably. 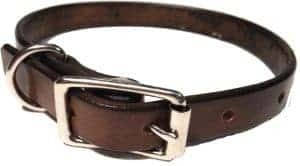 I’ve seen this type of collar used in a manner that resulted in a near coming to blows between myself and the person using the collar, and at the opposite end of the spectrum, used in a manner that positively transformed the lives of both the companion dog owner and dog. 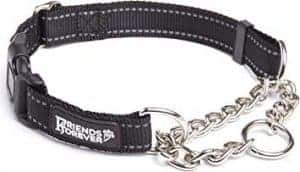 Any dogs I’ve trained using this type of collar, or that have been trained by trainers that I respect, enjoyed their training, and the extraordinary freedom due to reliability that the training ended up providing them. The downside is, depending on who shows you how to use them, (and many people sadly just wing it) they can be used as a “hand of God” device vs. a gentle attention ‘getter’ and direction ‘nudger’. Good ones aren’t inexpensive either, and it is far more difficult than it is easy to find a trainer adequately qualified. 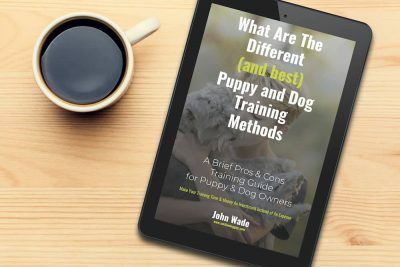 All too often, I see even trainers that consider themselves to be expert in their use don’t really understand how they work, or how to use them with the sort of subtlety that keeps a dog happy in its training. Some excellent trainers know how to use these collars in a very dog-friendly manner and if you can find one I have no problem with using this sort of training device. Used correctly, as opposed to the hand of God punishment tool they are so often used, yes absolutely, a dog can realize far more freedom far faster throughout their lives. The trick is finding someone to assist in learning how to properly use this tool. For what it’s worth there a lot of really crappy manufacturers as well. Unless the dog owner catches the behavior very early an e-collar is as likely to make this sort of situation (emergency brakes required) worse as better. Remote/wireless so there’s no potential for physically controlling the head. 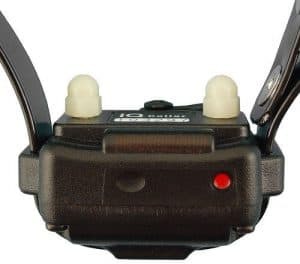 While the sad truth is that most seem to use this type of collar on aversive levels as opposed to a means of gently teaching a dog that his or her attention is required, if used more intelligently, an e-collar can be used to get and quite happily receive a dog’s attention. Quite possibly the most effective means – if used correctly and dog will happily give you his or her attention. However, all too often needlessly used as “Hand Of God” aversive training. If you’re expecting it, yes, but if you’re not as mentioned above there’s a risk of making things worse by confusing the dog and getting an escalation. Not rocket science but people even after being shown how to use the collar correctly often default to using it as an aversive. In training situations where an e-collar is deemed appropriate, the dog owners I work with are taught how to use the collar while I wear it and train me. Everyone gets it in the long run but this is not a procedure I’ve found necessary for any other type of dog training equipment. 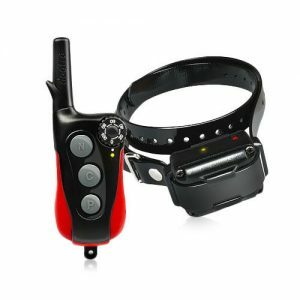 Tip: When the collar is to be attached it should always be first tested on the dog owner to ensure they do not forget to turn it on and make an error in their training levels later. Happens far more frequently than you would think. Again, not rocket science but not a matter of just putting on and taking off. See tip above and last paragraph below. I’d like to say yes because I know how much a companion dog can benefit from these collars if used correctly and I would except as mentioned earlier these collars are all too often used either due to ignorance or stupidity intentionally or accidentally as ‘The Hand of God’ aversive tools. I have seen properly trained dogs jump for joy when their e-collar come out. I have also far too often seen dogs look fearful when the collar comes out and even when someone reaches for a television remote. So, like many collars, an e-collar can be extremely dog-friendly and extremely unfriendly. However, they have significant enough potential to be unfriendly as to impact their rating in this area. Almost every injury I’ve seen associated with this type of collar is due to people putting the collar on too loosely resulting in the two collar contact points rubbing back and forth and causing a friction burn/hot spot on the dog. Every time the collar is taken off the area where the contacts points were touching the dog should be examined for any level of irritation. Of course not a collar at all and their use has sadly exploded due to the influence of ‘All Positive/Purely Positive/Force-Free…’, treat, treat, treat and more accurately the lack of influence their training recommendations have on the dogs that have the misfortune to cross paths with them. Collars do not choke dogs. Failing to teach a dog to not pull on a leash chokes dogs. Harnesses mask the lack of authentic training which is fine unless a companion dog owner actually paid money to learn how to train their dog. Not only are harnesses encouraged (albeit unknowingly) to mask the ineptness dog owners are being told or find they must heel their dogs on their dominant arm side unaware that this has never been the case in the history of dog training. Why? They need to apply frequent, (often non-stop) joint-taxing ‘restraint-reminders’ is so great that the non-dominant side option is no longer viable. The first is the potentially serious damage done to a young dog’s skeletal frame. This is a particular concern for any dog under 18 months of age. Whereas the puppies will in their owner’s eyes pull less (as opposed to not at all – which they are perfectly capable of learning) but pull none the less, with unnatural daily pressure applied to areas of their bodies not designed for that type of pressure. Puppies and adolescent dogs have growth plates which are soft areas at the ends of the long bones. The key word there is ‘soft.’ As they grow older, these areas have rapidly dividing cells that allow bones to become longer until young adulthood. I suspect only because harnesses are a fairly new fetish promoted by these trainers that we are on the cusp of learning that ‘All Positive/Purely Positive/Force-Free…’, treat, treat, treat trainers will be the reason a few generations of dogs have become inexplicably more prone to shoulder and elbow injuries and arthritis. The second reason is that the dog never truly learns to take direction, they don’t learn to exert self-control, which on the street means they aren’t keeping the leash loose when they encounter people, squirrels, other dogs etc. The dog owner wraps the leash around their hands a couple of times and either dig in their heels or tugs their dog away and out of sight. Allowing a dog to pull partially is a part of a protection dog agitation training for a reason. It magnifies the behavior as opposed to discouraging. The untrained harnessed dog’s chances of becoming leash aggressive increase as a result. If the target coming towards or on the other side of the street is another dog. All too often that dog is also wearing a harness and is also somewhat or fully agitated which fans the flames further. Note: There are legitimate times to use a harness. Some of the toy breeds of dogs have been so poorly bred that the thickness of their tracheas and esophagus is akin to paper and as a result are susceptible to injury. Not in a million years. These are the poster child for equipment destined to represent the continuous life long over and over application of the brakes. The only time where a harness is highly recommended is for medical reasons such as the toy breeds which have a susceptibility to trachea and esophagus thinness or a dog with a neck injury. The other time where a highness might be recommended is if the trainer is so inept that they do not know how to use a collar of any type without ending up choking or otherwise harming a dog. However, I normally wouldn’t let such a person train my dog, use carpentry tools, near kitchen utensils, change a diaper etc. Harnesses provide no control over a dog’s head and far less control of a dog that becomes agitated than their owners might have gauged when the dog is less stimulated. As a result, should the dog’s owner need to disengage their dog due to an unfortunate encounter of some sort they will be far less able to do so. Allowing a dog to pull partially is a part of the protection dog agitation training for a reason. It magnifies the behavior as opposed to discouraging. The primary risk regarding physical harm is due to unnatural pressure applied before the dog’s growth plates have finished. Other than that there’s little risk of harming a dog wearing a harness unless you become very serious about needing to get an agitated dog’s attention. Nearly impossible without ending up knocking the dog off his or her feet. Harnesses give the dog’s owner no useful control if the dog turns their attention towards them. Big problem if it’s aggression when you can’t control the head and body. Still, a considerable problem if it’s a large goofy enthusiastically friendly dog. In the legitimate training world, I’ve never seen harnesses used to train a dog successfully whereas I have seen them used once a dog is trained or in contexts outside of obedience specific training (tracking, service dogs etc.) So, simple enough I suppose to use from a training perspective, depending on how you define training. The first few times can be a pain as you’re figuring out what goes where on the dog and which bits of the dog go where on the harness and then adjust to prevent accidental removal. Overall, it takes a lot longer and requires a dog in a cooperative mood. More resistance from a dog in adapting to this sort of contraption than most other training tools, but not too bad. The biggest marks against the dog friendly-perspective is as was described in the general description regarding the unnatural pressure on immature bones. Before harnesses, and probably starting about 20 years ago, there was another ‘this collar is ’humane,’ and all others are evil,’ promoted by the ‘All Positive/Purely Positive/Force-Free…’, treat, treat, treat community. That is until they could no longer deny that the ‘promised’ ‘gentleness’ was fiercely debated by the dogs forced to wear them. Dogs almost universally try to rub these devices from their faces. The ‘miraculous’ results promoted by the ‘All Positive/Purely Positive/Force-Free…’, treat, treat, treat trainers were due to the significant ‘uncomfortable to painful leverage’ applied to the dog’s cervical vertebrae. For as long as it lasted, this was good for these trainers as it masked the failing of their training ideology and their clients needed something to replace the lack of actual training. On average, eventually dogs grow somewhat resigned and rather than risk injuring their own necks refrain from leash pulling. This is a satisfactory solution for some companion dog owners and as long as the owner (and the dog) is well aware of the risks associated with suddenly lunging I haven’t a problem with them. However, they are tools for control as opposed to training to exert self-control. Nope, these are essentially nothing more than emergency brakes and contribute very little to authentic training. Pretty useful for the protection of everything other than the dog themselves as who wants to risk a strained or snapped neck. Medically and ethically, highly questionable when attached to a dog unfamiliar with the downside that is prone to high agitation. Certainly excels in this department so pretty good unless you happen to be the dog. 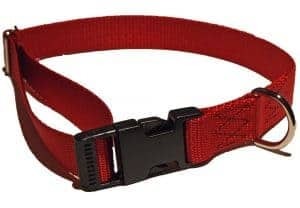 Although rarely used for much more than controlling an untrained dog it again does allow for getting the dogs attention however where with a more traditional collar it’s a tug on the neck that can range from low to hey, I talking here, to crossing the line and causing pain this collar is far less nuanced. More of a steer the dog away rather than get the dog’s attention so you can teach something. Pretty darn good but some risk to the dog. Once again, far more control instead of actually train tool. Not too bad after you get used to it but more complicated than better choices. Most dogs loathe them. Almost all will for some time rub their faces on the ground and go to various lengths to remove them. Eventually, most become resigned. Some of those become relatively indifferent. Others, walk well but it takes the bounce out of their step. They sort do the walk of the damned.